The goal of the game is simple; the players must work together to place the wooden blocks as compactly as possible onto the pallet. A perfectly played game with have exactly five levels, all completely filled with wooden blocks. 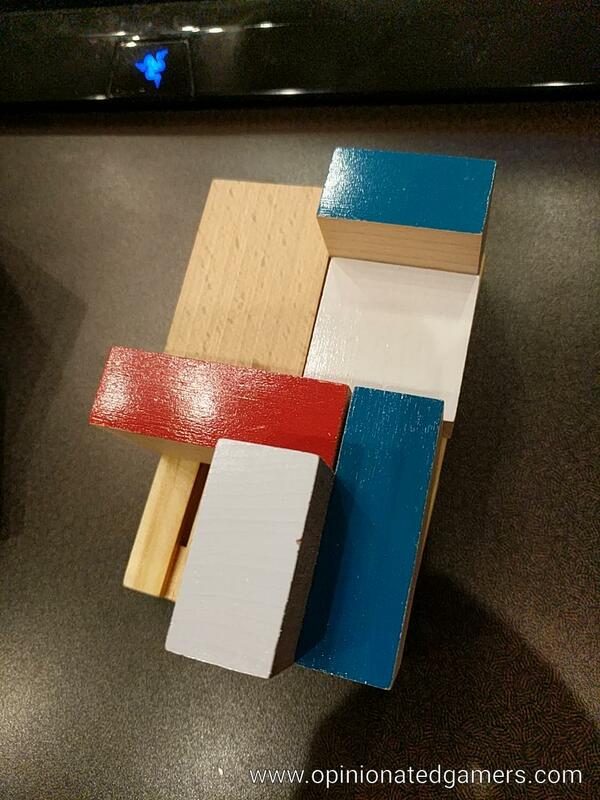 The game has 3 sets of colored wooden blocks and a neutral colored starting block. 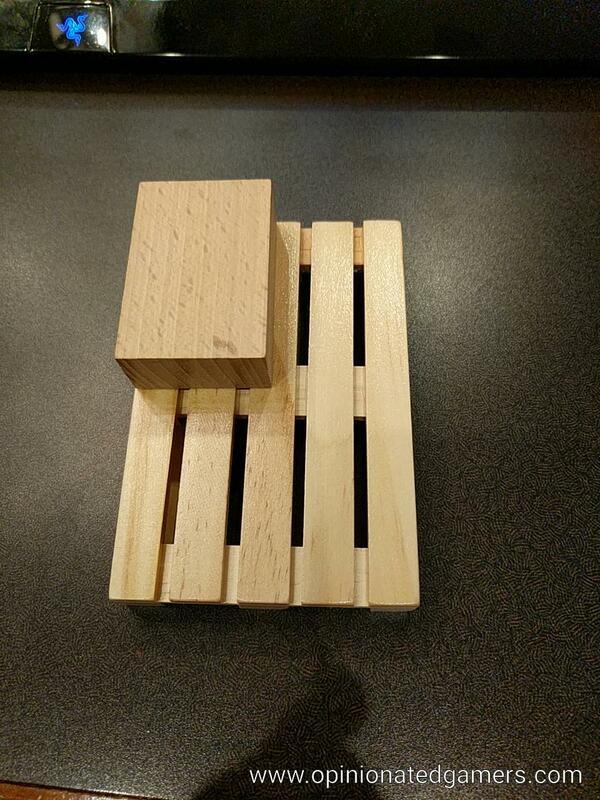 The game is played on a small wooden pallet, with the neutral colored block starting in the corner of the pallet. There is a deck of cards – each of which shows either a color or a block shape. On a turn, the active player draws the top card from the deck – which tells him either the color of block he must place OR the shape of the block he must place. The player chooses from one of the available pieces and the puts it on the pallet. The new piece must be face up (that means the colored side being face up), completely on the pallet (no overhang), must touch at least one other box, must not have a side which touches another piece 100% on that side (no cloning), must not float over empty space. As long as all of these conditions are met, the play is legal. The team can discuss what is the best choice of piece to use and where to place it, but if there is disagreement, the active player makes the final decision. Note that the game is NOT a dexterity game. There is no penalty is the blocks fall over. Simply replace everything in their original position and place the new piece. Once the piece is played, the card can be placed in the discard pile. If you cannot follow the instructions on the card – because the piece isn’t available OR you cannot legally place the piece in accordance with the above restrictions – that card is put face down into the discard pile. At the end of the game, your score will be penalized for each face down card. Play rotates to the next player who draws a card and then tries to place a piece. 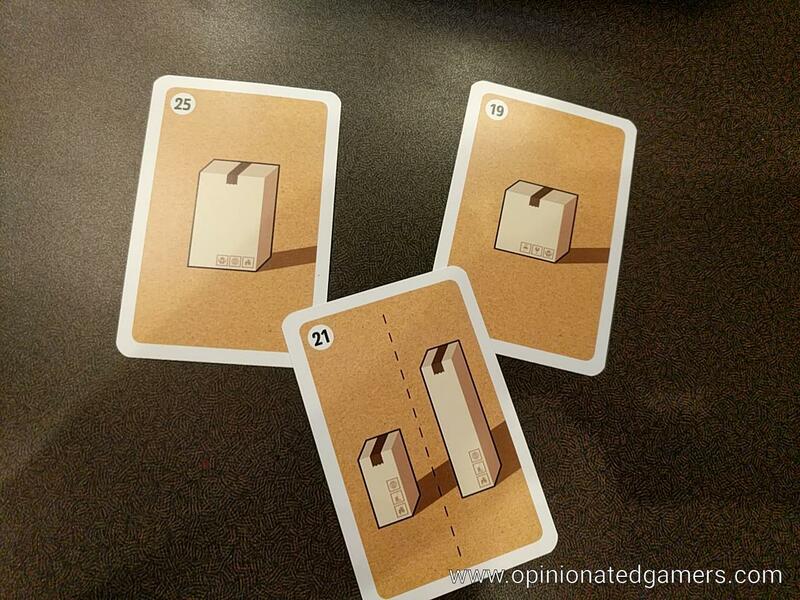 The game ends when one of the following happens: 1) all of the boxes are placed; 2) there are no more cards in the deck; 3) the players all mutually agree that they want to stop the game – usually due to the increasing risk of penalties. Then, it’s time to score your game. First, you look at the layers which are 100% complete. The team scores +5 points for each such level. Then, there is a one point penalty for each wooden block not used as well a a one point penalty for each card which was placed face down in the discard pile. Again, a perfect score is 25 points for 5 levels all completely filled in. Team Up is a pleasant cooperative puzzle game. At first, I thought that there would be no difference in playing the game solo versus in a group, but I have found that it is quite helpful to have other people looking at the ever growing stack of blocks to give advice as to both block choice and placement. It is surprising how sometimes just sitting on the other side of the pallet can show different possible placements. If you shuffle the cards up prior to playing, luck of the draw will play a much larger role in the game because you might draw a card which simply can’t be played. There is an alternative setup where you draw the cards in ascending numerical order (1 to 36). The cards are set up such that it is possible to build a perfect pallet using the cards in that order. Until we are able to win the game, we are currently playing with this setup as it provides an easy comparison of scores from game to game. We have come close so far with our best score being 21 – but we have yet to achieve perfection with this setup. There isn’t too much strategy here – but it does help to keep track of the colors and types of blocks remaining. One easy way to take a penalty is to not have the type of block available that is specified on the card. Managing this is essential to a high score. Also, it really helps to keep a close eye on the way the blocks are being placed on the pallet so that you have a lot of flexibility is placing the next block. It is easier than it looks to leave yourself in a situation where you can’t play something due to the cloning rule. 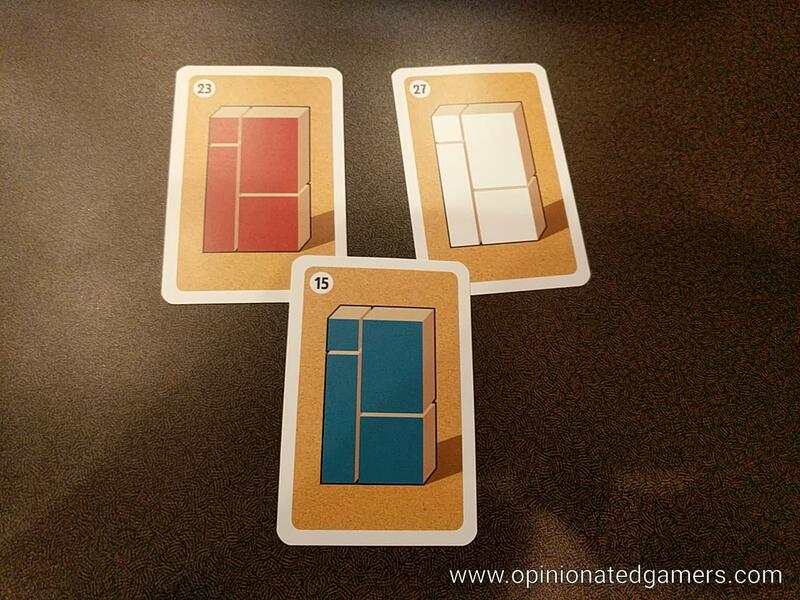 The game is a nice filler, taking maybe 15 minutes to play, and it is great for the start of our game nights as you can easily add players as they trickle in at the start of the night. I’m not sure how much staying power it will have as it is somewhat solvable (well, at least the numerical card setup), but it’s still getting played for now, and we’re enjoying it! Steph Hodge – Highly enjoyable and one I would love to play again!